I am no different some days when it comes to my art work. I have books and books of projects I started but never did finish. Not because I didn’t like them, but merely because I wound up getting involved in a completely different project. The picture below is a little Fairy I did over a year ago. Now I really like the sketch of this little fairy girl, and my plan was to use copic markers to color her. Unfortunately, she wound up staying in the sketch book and put away with the many other old sketch books I have. This mermaid below was meant to become a pen and ink sketch. Fear is what stopped from going further with her. You see I really liked the pencil sketch and was too scared I would mess her all up if I transitioned her to inks. This next mermaid I had planned on turning into a watercolor painting. I wanted her sitting on a treasure chest with all the wonderful sea life around her, complete with a seahorse and some fish. Unfortunately, I became involved in doing a test run of the seahorse which I then turned into a mixed media project, then when finished had forgotten all about the poor mermaid. That sea horse however I did finish!!! Do you often find yourself moving too quickly from one project into the next? Are half finished projects stored away in your closet, drawers etc.? If so how often do you actually go back later and actually find yourself finishing them? I always have many various things I am working on. I find it helps me a lot to do this. This way when I hit those pesky roadblock monsters threatening to push me into the Land of No Return or drive me to Depressionville, I have something else to move on to. Of course too many projects can be a block also for some people. My artist friend Michelle shared with me that sometimes, for her, too many projects can also overwhelm her. Kind of putting her in a place where she doesn’t know which one to work on. This is true for me at times also, usually when I have so much going on in my personal life on top of it all. When I first re-entered my artistic life though, I pushed myself to only do one project at time. This was due to me recognizing that I had a very bad habit of not finishing things. I would get to, what many call, the “ugly” stage of something and then quit. So to avoid this I put myself on a restriction and no matter how great of an idea I had for a New project I would not start it until I finished what I had already started. I would write my idea down instead. Kind of my own training/reconditioning process. Now however, I have no problem pushing past my ugly stages and have completed many projects consistently. Therefore, I no longer feel the need to keep myself to just the one at a time rule. Another reason I often have so many things going at one time is that I just tend to go through the, “I am bored stages.” Do you get that way at times? That feeling where you find yourself constantly sighing? Struggling to move forward or even procrastinating with doing your next step? If I try to push through the bored stage, I tend to find myself not being as attentive to what I am doing and before I know it have forced myself into another ugly stage, which could have been avoided if I had just let it be. I need my art to be free, I need it to be fun as I am working on it. If it is not fun, then for me it is time to put it away and work on something else. Do I need to have the 12 things going at once? No, not really. But I do need to have at least a couple, and when I find my creative mind just is not there, I break out the color books!!! But my color book craze I shall leave for another post. I’d love to hear your feedback on Projects Galore and how many is too many for you. I am so excited to be able to finally share with everyone, that I decided to show you what I am currently working on. This piece is Mixed Media and was inspired by tutorials I had taken by the talented Megan K. Suarez. If you have not checked out her tutorials and works, I highly recommend that you stop by. She takes you step by step from the drawing process all the way through to the final steps and is very easy to follow along with. She also used various mediums, including Copic Markers and Acrylics. I will post links to her site and Facebook at the end of this message. In the future I hope to do some step by steps for you on some of my projects, and eventually some YouTube videos. In the meantime I wanted to at least share what I am using. 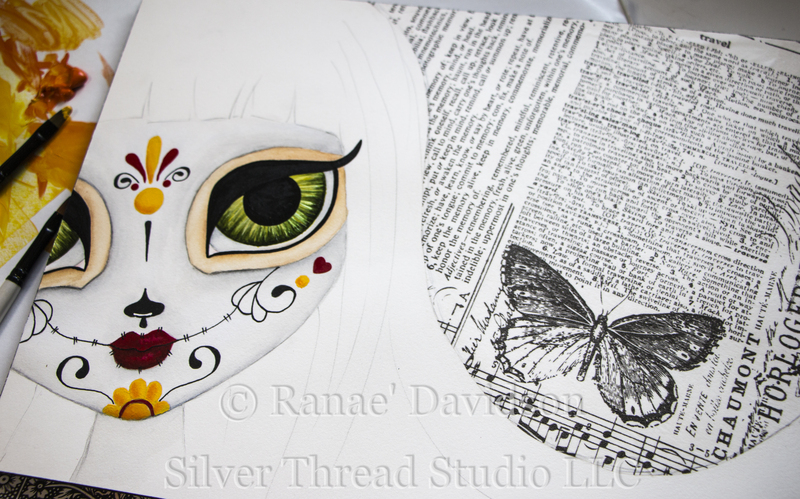 I am in love with Sugar Skulls, they are so much fun to create and have that whimsical side that really moves me. It will be interesting to see how my version of them develops over time. This piece does not have a name, so if you have a suggestion let me know. I would love to hear your input and ideas.